It’s the visual meme that keeps on giving for Jim Murphy MP, the newly elected leader of the Scottish Labour Party: his smiling embrace of one end of a black model submarine (the other end gamely held up by its manufacturer). To be scrupulously fair, it’s a less lethal version of the replacement for Trident that Murphy has (until now) so enthusiastically endorsed. But visually, it can stand for an element of this ex-Defence Minister’s policy record - supporting interventions in Iraq and Afghanistan, doctrinally Blairite on private involvement in public services - which would usually leave him an easy target for the SNP, the Greens and the wider left Yes movement in Scotland. But the other defining Jim Murphy image - shrugging off an egg thrown at him during a street hustings the Independence referendum campaign, temporarily toppling him from his Irn-Bru crate - shows just how tough an opponent he will be for the post-Yes tribes, perpetually seeking “more powers”. If Gordon Brown resonated with wavering No voters as a “son of the Manse”, echoing with the certitude (and rectitude) of the Presbytery, Jim Murphy is evidently from the other politico-religious tradition in Scottish Labour - the Irish-Catholic working-class lad made good, who knows exactly how deep the loyalties to a party of working people thrum in Scottish life. Of course, this prole awareness didn’t stop Murphy’s reasonably glittering career arc through Westminster, Whitehall and other enclaves of Londonopolis (as it has barely hindered many before him). He has landed in odd places, though - for example, as board member of the hawkish and Atlanticist Henry Jackson Society, whose associate director Douglas Murray writes at length this week about slapping & sleep deprivation as permissable interrogations. But a political Scotsman on the make is as much about self-making as money-making (though Murphy also has his expenses claims burdens to bear). And thus it’s no surprise to see his first major speech as leader is full of bold moves and reframings. A new “Clause Four” will define Scottish Labour as a “democratic socialist and patriotic party” (no, that word-order doesn’t bear too much rearranging), putting “Scotland first” in all matters. Murphy’s commitment to a 50% top tax rate, to be applied when (or if) the Smith Commission’s income tax powers come to Scotland, has hardened up SNP leader Nicola Sturgeon’s commitment to match the same rate. Murphy’s “I’m in charge” rhetoric on the political media is bullish vis-a-vis London, even specifically against Miliband. This is an attempt to neutralise the explosion detonated by his predecessor, Johann Lamont, and her public complaint of the Scottish party being regarded as a “branch office” run by “dinosaurs” in London. With a dutifully Unionist mainstream media in Scotland polishing up his every nugget of his anti-Blairite rebranding, it would be hard to say that Jim has not had a good start. He probably needs it. Few expect the SNP to maintain their current 20-30 point lead over Labour all the way to the General Election finish line in May. But there is reason to believe that the legendary pragmatism of the Scottish electorate, post the establishment of the Scottish Parliament - choosing SNP to develop Holyrood, and Labour to defend interests at Westminster - has undergone a profound mutation, post the referendum campaign. As a consequence of the intense, passionate and networked movement which comprised the Yes vote, even in spite of the UK media-establishment blitzkreig of fear messages, they have developed a strong collective memory - reinforced by a continuing culture of meetings, blogs, podcasts, social media meme wars. And one of their irreducible memories is that of a Labour Party standing shoulder to shoulder with Tories (and their poodling Coalition partners). In distinct contrast to Murphy’s current boosterism, the “Labour and Conservative Party” (as some wagsters phrase it) sang the same song-book of poverty, doom and disaster about Scotland’s prospects post a Yes vote. Murphy is betting that the friable thread of trust between the Scottish people and Scottish Labour can be rewoven. He could be too little, too late. It is entirely possible that the fabled intelligence of the “Scottish Electorate” makes this precise calculation - that a straight substitution of SNP MPs for Labour ones is in their best interests in May. And this not just from fervent Yessers - which is fervent enough - but even including devo-max Unionists, who voted No for “more powers” at least, and who are underwhelmed by the offerings of the Smith Commission. A recent ICM poll showed that 63% of Scots want full devolution of taxes and welfare, compared to the partial offer of the Commission - and 58% want full control of pensions, where there is none under the new proposals. The new SNP leadership is making it easy for all of them. Nicola Sturgeon that has utterly ruled out any compact with a Tory party at Westminster, and has set out some attractive conditions for any deal, whether coalition or confidence-and-supply, with Labour - including the cancellation of Trident in concert with Plaid Cymru and the Greens; and a demand for "more powers" for Scotland, likely based on the SNP’s Smith Commission contribution which reserves all powers to Scotland barring currency, defence and diplomatic powers. And even though Salmond is Marmite to many in Scotland, I suspect that even some of his detractors would quietly enjoy the Great Beast stomping around Westminster, contesting the agon with lesser talents in the Hogwarts Palace. So Mr Murphy has his work cut out. However, I can confidently predict than press-calls where he manhandles weapons of mass (or even targeted) destruction will not be on his busy agenda. My column for The Scotsman, 11 Dec 2014. I would be the last person in the world to call themselves a Unionist. However, the Scottish people voted, by a small majority but on a huge turnout, to stay within the Union on September 18th. So no matter how rusty and clunking my mental cogs are on this topic, like millions of other Yessers I’ll have to get them moving, rather sharpish. There’s a brutal electoral contest looming. First off, the disappointments (as if we haven’t had enough): it seems as if a “YesAlliance” ticket cannot be assembled for the May 2015 General Elections. At the beginning of the week, the Scottish Greens and the SSP both blamed the SNP for not being open enough to the possibility. This occasions a weary sigh, at worst - certainly no anger towards any part of this failure. The explosion in SNP membership is objectively remarkable - but I’m sure Salmond’s immediate resignation, and Sturgeon’s near-immediate coronation, helped greatly. For that 15% that added themselves to the 30% SNP core vote in the indyref, many would be voting Yes in spite of Alex (that’s his bruiser legacy). To them, the new Era of Nicola would seem like the next expression of the positive, inclusive, modern pluralism that typified the whole Yes campaign - and they rushed towards it, turning trauma into progress. I know this move from personal experience. Many colleagues that were Yes campaign lefties (and far-lefties) - like the comedy impresario Tommy Sheppard, the actor Tam Dean Burn and the radical lawyer Aamer Anwar - have publicly committed themselves to SNP party membership (and in Tommy’s case, candidacy). Family and friends tell the same story. So with this cast of Yes-inspired characters (and I’m sure many more like them) adding themselves to the Nationalist member lists, maybe the YesAlliance did manifest itself - but it’s now bubbling and machinating away within the SNP itself. Which we should perhaps now call the “YesNP”. Having captured the post-referendum zeitgeist so completely, how much character and vision would it have taken for the SNP leadership to offer a lot more than their odd, you-don’t-have-to-join-but-you’ll-take-our-whip scheme for non-SNP candidates? Obviously, more than they possessed. I joined the Scottish Greens after the election. But I can’t say I’ll be delighted to see them wave their tiny fists at an SNP juggernaut, across a sprinkling of Westminster seats, next May. First past the post is a cruel set-up, encouraging party tribalism. The sooner we replace it, whereever it exists, with a properly proportional system, the happier life on these islands will be. Which brings me to the next clanking of unused Unionist mental machinery. We know that we have to send a “Scots Bloc” (similar to the Bloc Quebecois) to Westminster next year, directly displacing many Labour MPs (and letting no more Tories in, if we can manage it). We need this, in order to ensure that Scots wrest from the Palace of Hogwarts anywhere near the powers of self-government that a long and consistent history of polling suggests they want. Which even the dogs in the street know is way beyond the Smith Commission’s miserable tinkerings. We also know that some of the home-rule majority in Scotland will have to lend their Westminster vote to the SNP, to give that Scots Bloc the numerical heft they need in order to be serious players in the game of Thames. 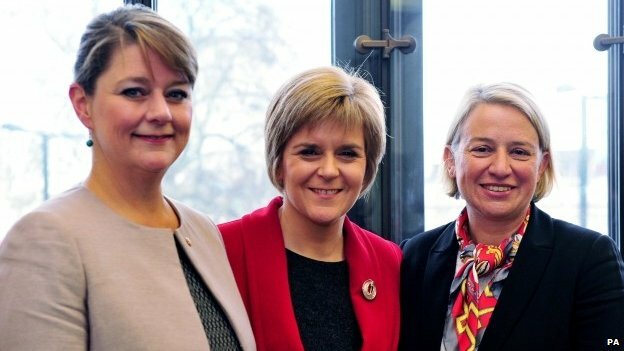 Let’s presume - settling down with our popcorn - that the SNP, with some Greens and Plaid Cymru, can help Miliband’s Labour effectively govern after the election. What intrigues me most is the extent to which these parties, but particularly the SNP, can imagine themselves as “whole-island reformers” - or not. In fact, I can report from my part-time London life that a Scots/Celtic/Eco-Bloc, interested in island reform, sends vapours of hope and joy among many of the centre-left here. The grim vista offered by Polly Toynbee the other day - Labour might be utterly appalling, but they’re at least not as utterly appalling as the alternative, so vote Labour - is as disheartening to idealists here, as it is ludicrous to the home rule Scottish voter. This really is the last chance for the Union, if it was ever to transmute into the kind of well-fashioned federalism/confederalism that even former colonies can manage easily. I’m sure the Salmond ego would love to claim the Gladstonian mantle; I’m also sure that Nicola has the imagination to think across the archipelago. The SNP has had a geopolitical strategy for the North of England, supporting its counter-balance against London, for years now. And what if an outcome of a Scots Bloc was a UK-wide proportional voting system? But the ball really is in the Miliband court. If they are genuine, long-term reformers, will they seize the chance, and let the margins transform the centre? Or will Westminster metropolitan arrogance stultify their response at the last? For those of us who were supposed to be defeated, it’s a late embarrassment of options. Or will a rougher beast slouch from the shadows on election day in May? I genuinely don’t wish for a Tory-UKIP majority. It would be - to misquote my elders - sheer malevolence on stilts. However, the strategy changes completely under that scenario. The Scots political classes - which would themselves be in upheaval, given Labour’s expected displacement - really would be orchestrating a dash for the exits, by any plebiscitary means necessary. But if we get our message right beforehand, I think we could appeal to our formerly No-voting countrywomen and men with palms outstretched. We did try to let the Union save itself. Now we have to save our selves, from a Euro exit and worse - much worse. The old curse holds: May you live in interesting times.